Do you know what satellites sound like? In space they are silent sentinels, flying high above us and visible as a small glint of moving light in a dark, clear sky. We know they emit waves and signals of various kinds, but we can’t hear our text messages and phone calls being pinged around the globe. Or can we? NASA collaborated with architects Jason Klimoski and Lesley Chang to create a way to hear the sounds of different satellites orbiting above the Earth. 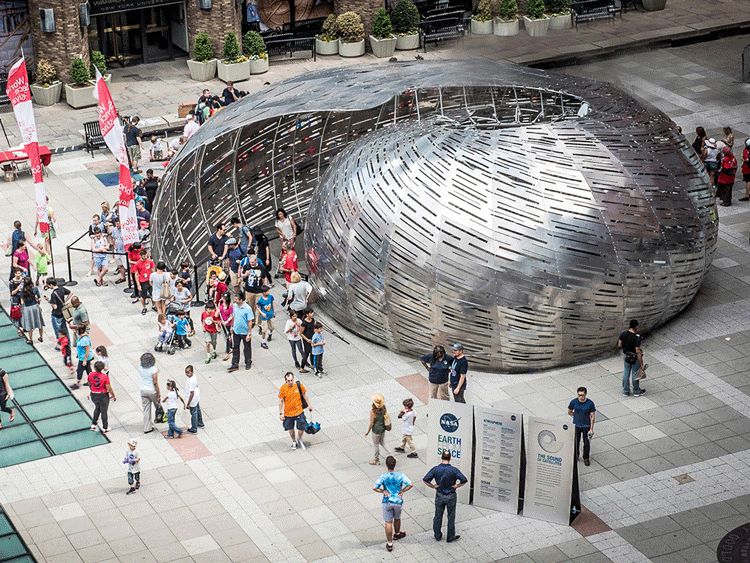 The duo created a seashell-shaped structure, called the Orbit Pavilion, which amplifies the unique sounds made from 20 satellites including the International Space Station. The Orbit Pavilion resides in Pasadena and San Marino, California, at various times throughout the year. The satellites that NASA wanted to track were each assigned a specific tone, which speakers inside the Orbit Pavilion would amplify for people sitting inside the structure. Each of the tones represents the specific satellite’s mission; for instance, if a satellite collects information about the atmosphere, you may hear the sound of rushing wind through trees. Other sounds used in the Orbit Pavilion include crashing waves, the croak of frogs, and human voices. The sound travels around the Orbit Pavilion much in the way the satellites themselves orbit the Earth. The Pavilion was designed to represent the satellites’ path using audio, rather than the traditional imagery NASA has relied on to give us a glimpse of the activity in the sky above us. The Orbit Pavilion doesn’t represent the exact orbital path of the satellites in the sky above us, but presents a condensed version for easier modelling in the structure. This makes it easier to experience the path of satellites without having to wait an hour and a half, the real amount of time it takes for the International Space Station to orbit the Earth. NASA has once again found a way to make what exists in the sky above us palatable, a kind of space audio art display in the seashell-shaped Orbit Pavilion. After its debut at the World Science Festival in New York City last summer, the Pavilion is set to reopen at the Huntington Library Botanical Gardens in San Marino, California in the spring.